Welcome to "Arroyo Madera 105". This wonderful single story, 2 bedroom townhome is the perfect rental for your stay in Scottsdale, AZ! This home is located within minutes of Scottsdale Honor Health, Talking Stick Resort & Casino, and Salt River Fields - Spring Training facility of the Arizona Diamondbacks and Colorado Rockies. This home is newly furnished and ready for your arrival! The great room layout features the living room which is accommodated with a plush sofa, and three accent chairs all centered around a gas burning fireplace and mounted 55" flat screen TV. The kitchen is upgraded with granite counter tops, stainless steel appliances and everything you need to cook a nice dinner for a party of up to 6 people. On one side of the home is the master suite. This spacious room has a quality king size bed, two nightstands with reading lamps, dresser drawers and flat screen TV. The en suite bath has a custom walk-in shower and dual vanities. There is a private patio set off the master bedroom with a bistro table and two chairs. Relax and enjoy your morning cup of coffee from here. On the other side of the home is the guest bedroom which has two twin size beds with a nightstand and readying lamp. You can directly access the full guest bathroom from either here or the hallway. This home does have a 2 car garage that will fit two mid-size vehicles. Oversized trucks will not fit and will need to park in open, available guest parking. For those who enjoy dining outdoors there is a BBQ grill and a table for six in the enclosed yard. 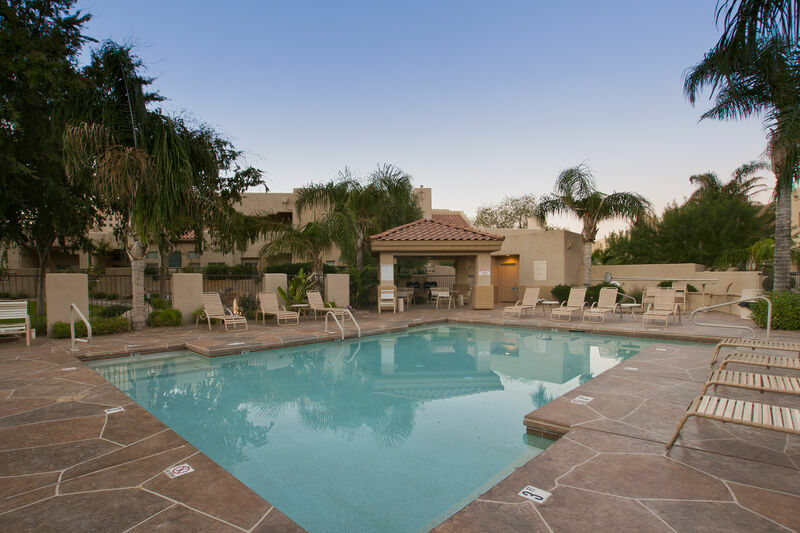 The heated community pool and spa is just a stones throw away. The location was perfect, Convenient to everything. Loved the cozy 2 bedroom condo. Had everything we needed and MORE! Outside patio was great for grilling and/or sitting with a coffee/glass of wine. Wished I could have stayed forever. Staff at Casago was attentive and helpful with everything we needed.